Urinary bladder is also subject to many diseases like retention of urine, incontinence, paralysis of sphincter, etc. Urinary bladder and urinary tract can often get infected. Prostate disorders are common amongst elderly males. All such urological disorders lend themselves to acupressure treatment with effective results. This book describes in great detail various kidney and urinary tract disorders and their acupressure treatment. 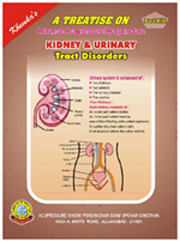 Functions of the kidneys and urinary bladder and patterns of their diseases as per the Chinese concept have been lucidly explained in this book. Some of the topics covered in the book are anuria, oliguria, polyuria, nocturia, hematuria, retention, incontinence, urinary obstruction, urethral stricture, enuresis, urinary tract infection/stones, kidney cysts, hydronephrosis, nephritis, nephropyelitis, nephrotic syndrome, renal failure, prostate hypertrophy, chyluria, spermatorrhoea, etc. This book will go a long way in helping an acupressure therapist in treating even the most complex cases relating to kidneys, bladder and the urinary tract. a renal peviv where the urine collects.